Since registering 5ThirtyOne.com with DreamHost, I’ve despised the SquirrelMail interface. By forwarding all incoming mail to a personal account, I’ve managed to bypass any unnecessary interaction with the interface. While some users may prefer the simplicity and stark layout options, I prefer the familiar interface of my personal Gmail account. Fortunately, Google Hosted dropped an invite allowing me to register and setup 5ThirtyOne for the hosted [Gmail] service. I’ll walk through the painless transfer [DreamHost to Google], basic customizations, and final thoughts. Introduction – Yes! No different from Gmail!! Transfer – Great, so how do I get my domain email? Customize – Very basic, but subtle details work! Administrating – I am root! Before going willy-nilly with the idea of Google hosted email, understand that standard accounts are no different from personal Gmail accounts. Aside from the custom logo and the “powered by Google” moved to the footer, the average user wouldn’t tell the difference. Wait, I guess the new username@5thirtyone.com in the top right corner is different. Rather than highlighting the similarities, a brief run through of the differences will suffice. No tabbed interface for jumping between your hosted Gmail account and Google Calendars. Hosted Gmail account credentials do not work with Google services that require a ‘Google Account’. Administrative access can be granted to normal accounts on a per user basis. Again, aside from a few minor details, Hosted accounts are really no different than general Gmail accounts. So I’m hosted, now what? So you’ve managed to get your foot in the door and have the Hosted Email ‘Dashboard’ up on your screen. Now what? To the person thinking “duh, redirect your domain email to Google Hosted” you are correct! No reason to get squirmy here. The process is quite simple [aided with the necessary documentation from Google of course]. The key to a smooth transition is locating your Mail Exchange (MX) settings (usually under ‘Mail’ settings, ‘DNS Management’, ‘Mail Server Configuration’, or ‘Name Server Management’.). 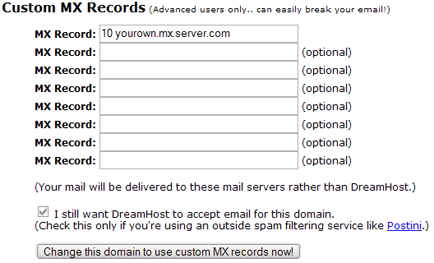 For DreamHost users navigate to DreamHost Control Panel > Mail > MX. Click ‘Edit’ next to your primary domain after which you will be presented with a screen similar to the one below. Notice the warning message? Incorrect values will prevent email from landing in your account. As documented by Google, enter the correct Mail Exchange values for your account which can be found on the Dashboard MX Records page. Note: Google states that the transfer may take up to 1 business day for the MX settings to go into effect. Personally, received mail began landing in the inbox almost immediately. The ability to send mail may take longer. While you’re sitting around waiting for full account functionality, why not familiarize yourself with the ‘Domain Settings’ [read customizations]? 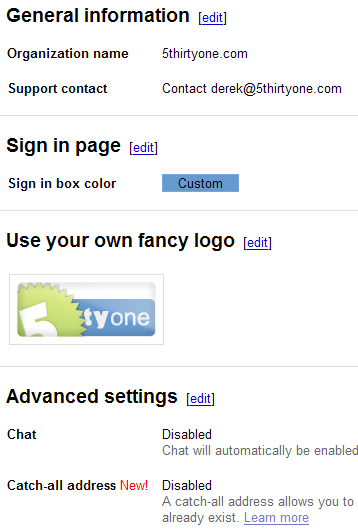 General Information: Your domain name and contact information [for situations when users need an admin contact]. Sign in page: Customize the sign in box background and border colors. User your own fancy logo: Probably the best part of customizing. Create your own 149 x 59 pixel graphic. Advanced settings: These settings rely heavily on your Mail Exchange settings. Gmail ‘Chat’ and ‘Catch-all’. Chat amongst fellow Hosted Email users. In addition, have all emails sent to your domain without an actual address caught by your admin address. Basic indeed right? A bit of a change from the standard Gmail interface. Google Hosted Email administrators have a great set of options for keeping domain email accounts in check. Create users: Self explanatory. Create individual accounts for users. Specify first name, last, address@domain.com, and assign a specific password or generate a random password for users to change after their initial login. Admin rights: Assign administrative rights to select users. Only do this for trusted users. Nicknames: Assign additional addresses to a single user. Example: Messages addressed to y@domain.com and u@domain.com can be configured to land within z@domain.com. Mailing lists: Simple and effective method for creating mass mailing lists for your domain. Create a mailing list address and add select users. Monitor: Monitor email account quotas and last user logins. Paid hosting vs. Google Hosted: +1 Non-Google. Security and privacy wise, an included email or dedicated email host, is a far wiser choice. No peaking bots scanning emails for targeted text ads and the like. As my good friend from UNEASY put it: [using Google] is like letting someone always look in your bedroom window. Once you familiarize yourself with the standard keyboard shortcuts [or Gmail Macros GM userscript], there’s really no going back to something like SquirrelMail. Keyboard shortcuts, filters, and labels aside, with the power of Google search under the hood, is a comparison of SquirrelMail even necessary? Who’s going to deny the fact that Gmail’s Spam filters are one of the toughest in the industry? As stated earlier, emails sent to my domain were configured to forward to my personal account. Despite having DH’s built in spam & virus filter active, spam messages continued to slip through. Thankfully Gmail’s spam filter cleaned up the mess that DH filters dropped. In all reality, giant mail box quotas and a users ability to maximize data usage are negligible topics for casual email users. However, because this is a comparison, the point goes to non-Google hosted email for the simple reason that hosted plans usually allow administrators to specify a users email size. Google Hosted are limited to a paltry 2GB. Setting up separate users with Google Hosted is a breeze. Specify a users name, email address, and assign a random password. Period. No unnecessary clicks, or drop down menus. Remember the username limit for standard Gmail accounts? Non-existent. You can create single letter / numeral accounts like z@domainname.com. Similar to standard Gmail users, Google Hosted users have POP access for retrieving mail. Bandwidth usage due to file retrieval may not dent most users bandwidth allotment, but every MB counts right? Why utilize your own bandwidth when the stuff grows on trees on the Googleplex farm? Don’t let hosting woes slow down your business. Get a business email account set up with outlook exchange and let someone else handle the email headaches. Set up a small business email account with intermedia today!